Omega Constellation Collectors: A Rome Olympics Seamaster MCMLX? 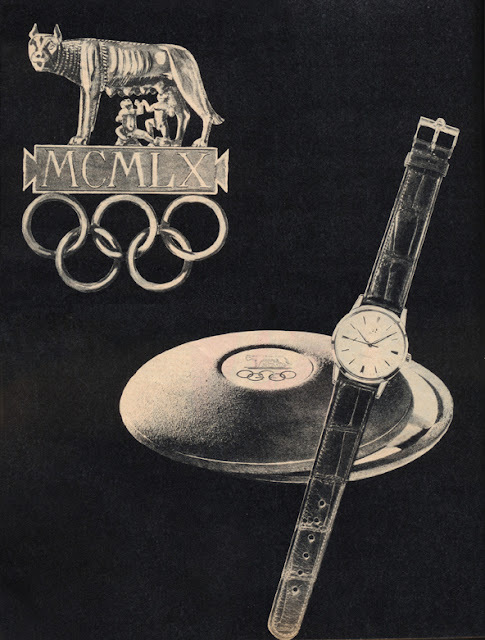 A Rome Olympics Seamaster MCMLX? The stainless steel case in the advertisement looks closest to the style of case 14779, which was also released in 1960. If you click on the picture above, thanks to Frank DR, you will notice the modern flat dial has double markers at 3, 6, 9 and 12 o'clock and features dauphine hands, but no special mention of the MCMLX Olympics. "By buying a watch you will have the absolute certainty of finally possessing something that for the whole of your life will exceed your best expectations. The following facts will demonstrate it. These gather together an impressive proof of the excellence of each single Omega watch"
I assume that this model was powered either by the 17 jewel calibre 550 or the 24 jewel 552 as these calibres were launched in late 1958 and the advertising copy alludes to an automatic movement. And not having seen this model in the flesh, I do not know if there is any special medallion embossed on the case back, but at the original price offered it would seem unlikely. A curiosity or a collectible? The discus shaped box will have become decidedly uncommon, owing to the normal attrition of boxes over time and would be a sought-after item in any corner of the globe. A complete set of watch, papers and box would most definitely attract strong interest and a significant premium. If you can contribute to the search for knowledge about the Rome Olympic Seamaster, please contact me. An update will be forthcoming when we get to the bottom of this mystery. Thanks again to Frank DR for this discovery. Hi, thanks for this article, it's proved extremely useful. I have recently been lucky enough to inherit an Omega Seamaster watch. The watch face states that it is a 'Seamaster XVII' yet the back states 'Seamaster XVI' and has the usual seamaster XVI embossed emblem (of the olympic rings on top of a 5 pronged star and a flame atop the most vertical one with a crowned lion on the bottom- type Seamaster XVI into google for a picture). It is definitely not a seamaster XVI however as there is gold lettering embossed on the face marking 'Seamaster XVII'. Best thing to do is take some good pics of the watch and attach them to an email. Just click on the 'about me' icon on the rh column and then click on email. Combination of xvi and avii is quite a mystery.